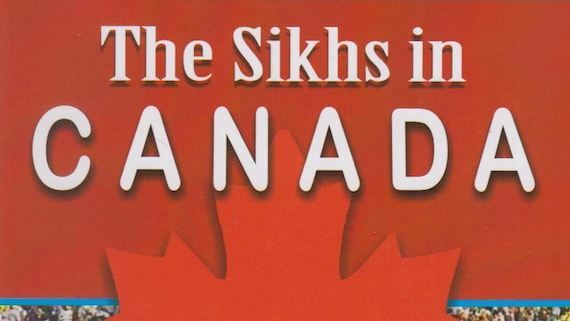 Chandigarh/ Punjab (February 01, 2014): According to India Today: “[m]onths before Prime Minister Indira Gandhi sent the Indian Army into the Golden Temple in 1984, she considered a covert commando raid to apprehend radical Sikh leader Jarnail Singh Bhindranwale”. India Today (IT) has recently published a detailed report claiming that it’s investigations into the recently declassified Margaret Thatcherer’s documents in the United Kingdom, revealed a raid that was planned by Research and Analysis Wing (R&AW) to “abduct” Sant Jarnail Singh Bhindranwale from a building outside the Darbar Sahib (also called the Golden Temple of Amritsar). 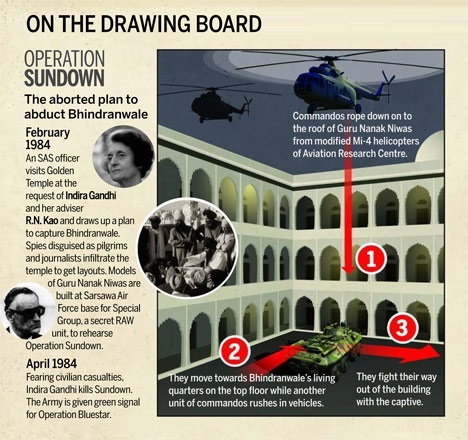 On the Drawing Board – Plan of Sundown Operation – published by India Today along with news-story: “The untold story before Operation Bluestar” published on Jan. 31, 2014. “Interviews with retired commandos and RAW officials revealed that the plan was initiated sometime in late 1983 at the behest of Gandhi’s security adviser and RAW founder, R.N. Kao” India Today has noted in it’s special news-story titled: “Indira Gandhi considered secret commando raid before Operation Bluestar” by Sandeep Unnithan New Delhi, published on India Today’s website on February 1, 2014. Recent revelations have made it clear that Indira Gandhi was planning armed action much earlier to June 1984 which reconfirms that claim of the Sikh nation that armed actions against the Sikhs pre-planned and there was no immideate compulsion before the Indian state or the Indira Gandhi’s regime to launch armed attack in June 1984 on the martyrdom day of fifth Sikh Guru. 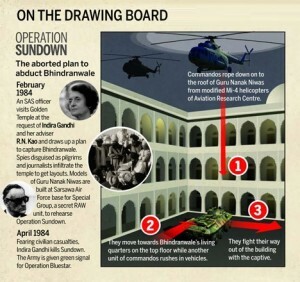 According to India Today: “[a]n official from Britain’s elite Special Air Services (SAS) visited India in December 1983 and vetted the plan in which 200 commandos of RAW’s military wing, the Special Group (SG), would abduct the separatist militant leader in a combined ground and air assault. SG commandos rehearsed for several months on a mockup of the three-storeyed Guru Nanak Niwas, which they constructed at their base in Sarsawa, UP”. “The commandos flew night sorties on specially modified Mi-4 helicopters and even practised heli-drops on buildings near Amritsar. A commando assault unit was to drive in from the ground and drive away with the separatist leader. The commandos did anticipate a firefight with Bhindranwale’s heavily armed followers”. The plan was, however, called off by the Prime Minister in April 1984. According to Indian Today “[o]ne of the reasons for scrapping the plan was that she feared civilian casualties in the firefight”. It may be recalled here that Indira Gandhi order armed attack on Darbar Sahib in June 1984, which was codenamed as “Operation Blue Star” in which Indian Army massacred more than a thousand Sikh pilgrims. The physical structure of Akal Takht sahib was destroyed with tanks-canon shots and the national Sikh library called the “Sikh Reference Library” was reduced to ashes. Army attacked on the martyrdom day of Guru Arjan Dev Ji, a day when more Sikhs were visiting Darbar Sahib to pay obeisance to the martyred Sikh Guru. According to India Today: “[h]azy outlines of this secret RAW plan were whispered about even in the aftermath of Operation Bluestar. Mark Tully and Satish Jacob’s 1985 book “Amritsar: Mrs Gandhi’s last battle” mentions a commando unit rehearsing a raid on a mock-up of the Golden Temple created in Chakrata”. “Military analysts, however, believe the plan had only limited chances of success. “The operation would have needed a guarantee of success, which a special forces kidnap cannot provide,” says Colonel Vivek Chadha (retired) of the Institute of Defence Studies and Analyses” India Today report reads further. 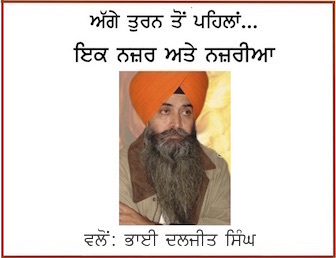 “”Bhindranwale’s heavily armed militants would have had a bloody skirmish with the commandos. The isolation of one building would have been a challenge.” Sundown now offers only a tantalising alternate view of whether history might have been any different if it had succeeded” India Today’s report reads in the end.